Despite all this evidence, many nursing homes still do not allow pets, and fear of giving up their animal companion is a serious concern for many in the community. For older people still living in their own home, pet ownership has many benefits including social facilitation and companionship as well as increased activity levels. If you have to move and are unable to take your pet with you, you do not have to euthanise your pet. For many of us, pets are like family. They can offer companionship and unconditional love. But many older people entering an aged care home may have to leave their pet behind, and the loss of this companionship can have a serious effect on the older person’s wellbeing. 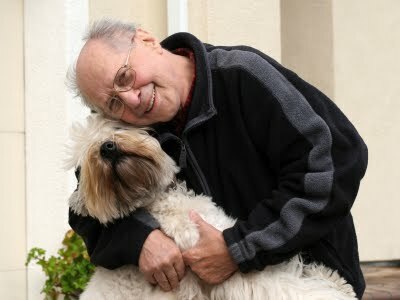 Are pets allowed in aged care? Not all residential aged care homes allow pets, but continuing to have them included in residents’ lives after entering a home can be rewarding. Allowing pets to visit an aged care home can give both staff and residents the chance to enjoy the benefits of a friendly pet without the responsibilities of ownership. However, some aged care homes also have ‘live-in’ pets, such as dogs, cats or birds. Which aged care homes allow pets? The DPS website features a comprehensive list of Residential Aged Care homes which welcome residents’ pets or house ‘live-in’ pets. You can access these by clicking on Residential Aged Care and selecting the type of care you require (ie Residential High or Low Care). Click on the Features category to the left of the screen and select Facility Pets to start browsing). Retired racer greyhound assistance dog! THE SECRET LIFE OF PETS….